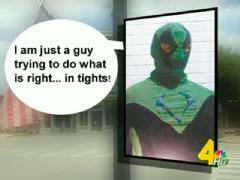 The 20-year-old man, who wants to remain anonymous, but calls himself the Viper, recently caught the attention of police in Columbia.Officers stopped the man just after midnight Wednesday when they spotted him in this costume.According to the Columbia Daily Herald, he told police that he was looking for crime to report.The self-professed comic book nerd was armed with a screw driver, wrenches and a cell phone , all of which were stored in a utility belt.Police urged the Viper to stop his patrols and told him that he was violating a city ordinance, which bans people wearing masks in public.He told the Columbia Daily Herald that, “I am just a guy trying to do what’s right, in tights.” On Monday, the Viper told Channel 4 News by phone that it’s a matter of pride protecting his hometown.The crime-fighting college student said he eventually hopes to become a comic book artist when he is done with school. This entry was posted in News of the Weird and tagged Comics, news, superheroes, wierd stuff. Bookmark the permalink.